Eliminates the conflicts that may arise when a sports organization is responsible for both promoting and regulating its own members. After an athlete provides a urine and/or blood sample to a USADA Doping Control or Blood Collection Officer, his or her sample is sent to a WADA-accredited laboratory for analysis. WADA-accredited laboratories are compliant with the WADA International Standard for Laboratories, thus meeting the strictest standards globally for the handling and analysis of athlete samples. All athlete samples are shipped to the laboratories, with no identifying connection to the athletes, removing any opportunity for bias in the reporting. The presence of a prohibited substance or its metabolites or markers in an athlete’s sample. Refusing, evading, or failing without compelling justification to submit to sample collection after notification or otherwise evading sample collection. Three whereabouts failures in a rolling 12-month period. Tampering or attempted tampering with any part of doping control. Possession of a prohibited substance or prohibited method. Trafficking or attempted trafficking of any prohibited substance or prohibited method. Administration or attempted administration to any athlete of any prohibited substance or prohibited method. Assisting, encouraging, aiding, abetting, conspiring, covering up, or any other type of intentional complicity involving an Anti-Doping Policy Violation, attempted Anti-Doping Policy Violation, or violation of Article 10.12.1 (Prohibition Against Participation During Ineligibility) by another person. – Is serving as a front or intermediary for an individual described in this paragraph. Following an assertion from USADA of an ADPV, the athlete or other person (Applicant) may contest the alleged ADPV by serving a written Notice of Appeal on USADA within ten days of his or her receipt of notice of the asserted violation. 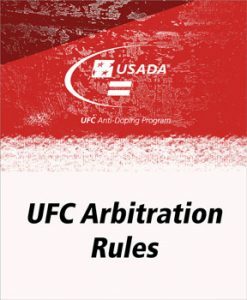 USADA will then provide the Applicant with a Request for Arbitration form, which must be completed and filed within ten days of Applicant’s receipt of the Request for Arbitration form along with the applicable filing fee. The failure by the Applicant to submit either the Notice of Appeal or the Request for Arbitration within ten days will result in the forfeiture of the Applicant’s right to appeal or otherwise challenge USADA’s decision. An athlete or other person charged with an Anti-Doping Policy Violation is entitled to a hearing in front of an independent arbitrator or arbitration panel. All arbitration proceedings will be conducted by the McLaren Global Sports Solutions Inc., which is completely independent from USADA. All evidence is subject to disclosure in accordance with the UFC Anti-Doping Policy and UFC Arbitration Rules, and all witness testimony shall be provided under oath, under penalty of perjury and subject to cross examination. The arbitration proceedings shall be confidential and not open to the public unless the parties and arbitrator(s) agree otherwise. The arbitrator(s)’ award, including the reasoning for decisions, shall be in writing and delivered to the parties within 30 days of the close of the hearing. In any case where it is determined after a hearing that an Anti-Doping Policy Violation was committed, the written award shall be publicly posted on the UFC anti-doping website.